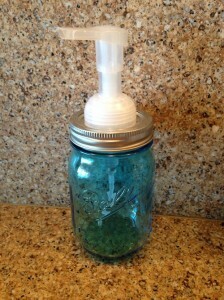 I love the look of the mason jar soap dispensers, but all of the DIY instructions I could find seemed so involved for such a simple looking project. Really, how many people own a drill press? Always looking for a simpler solution, I took a stab at trying to make one using as few tools as possible. The quick and dirty way involves just a hammer, nail and utility scissors. 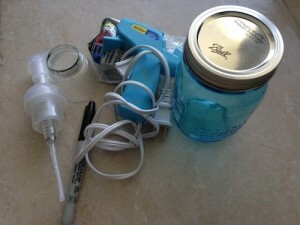 Although there is a glue gun in the picture, it turned out to be unnecessary. Unless you plan to mass produce mason jar soap dispensers for everyone on your Christmas list, or to make a few bucks, this way works perfectly fine. The pump came from an empty foaming hand soap container rescued from the recycling bin. The whole secret to foaming soap is in the pump, but if you don't want foaming soap, then it will not not matter what kind of soap pump you use. Some instructions call for you to cut the top part of the bottle so you will have something to screw the pump into, but I used it for cutting guide only, and then threw it back into the recycling bin. 1. 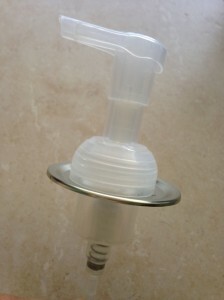 Cut the top section of the the plastic bottle that you got the pump from (just below the neck). 2. 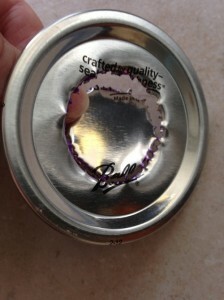 Center bottle piece on lid and draw a circle on the inside (this will make it a perfect fit). 3. Using the hammer and nail, make small holes on the circle line, right on top of each other so you are essentially cutting through the top. Make sure you are not doing this on a countertop or other fragile surface because the nail will cause damage when it pierces the lid. 4. Carefully remove the center - the edges are very sharp! 5. Insert pump through hole. This will be a tight fit, which is why glue is just an option. You may have to use the hammer and nail to make an adjustment or two. 6. Make your own foaming hand soap (it's very easy) and assemble the dispenser. You can use any soap you choose, even dish soap - just fill 1/3 full with soap of choice and the rest of the way with distilled water. 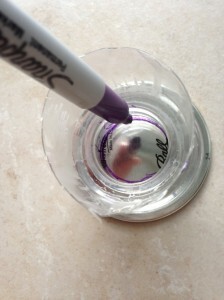 Gently swish together to avoid bubbles and then put the top on the jar. Experiment with soaps to see what you like best. I happen to like mixing Dr. Bronner's Fair Trade; Organic Castile Liquid Soap - (Peppermint, 32 oz) - and water - very refreshing! Note: Some tutorials included painting the pump, however I chose to leave it plain, because there were many complaints about paint wearing off after repeated pumping. Also, you could use the hot glue around the bottom edge of the dispenser if want to make sure that it will not leak if tipped over. I choose not to glue because it will be easier to pop it out and replace with a new one if the plastic pump fails over time. 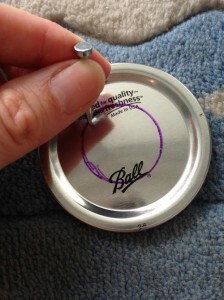 Another thought is to maybe save spare lids to replace after a while because I'm thinking that since these lids are made of metal they may corrode - time will tell.